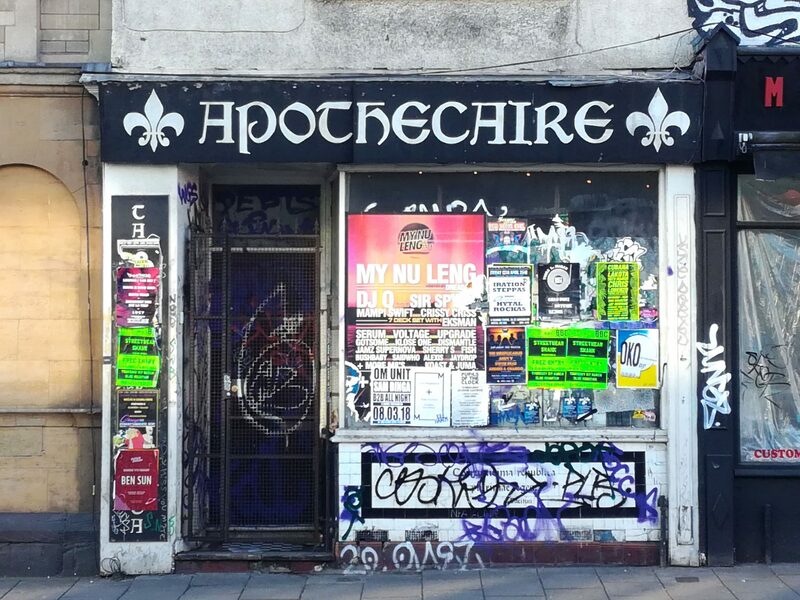 In March 2018, the Apothecaire on Stokes Croft was installed. 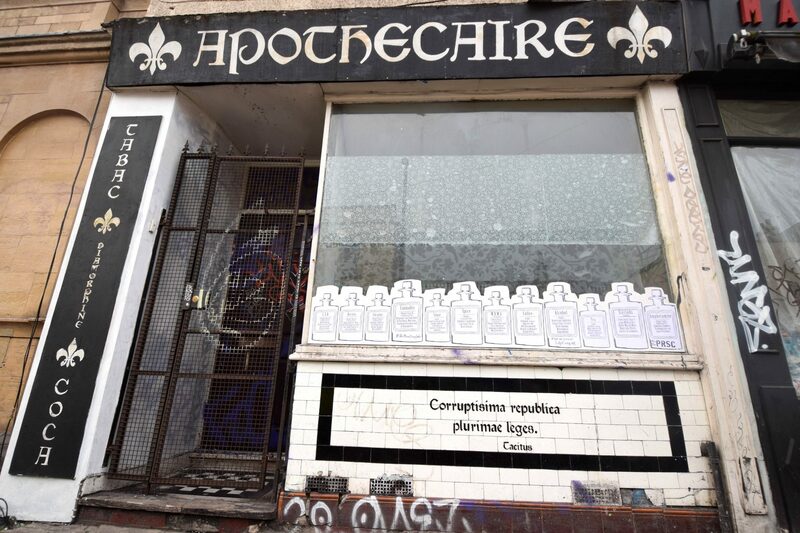 The area of Stokes Croft is particularly challenged by issues over drugs. 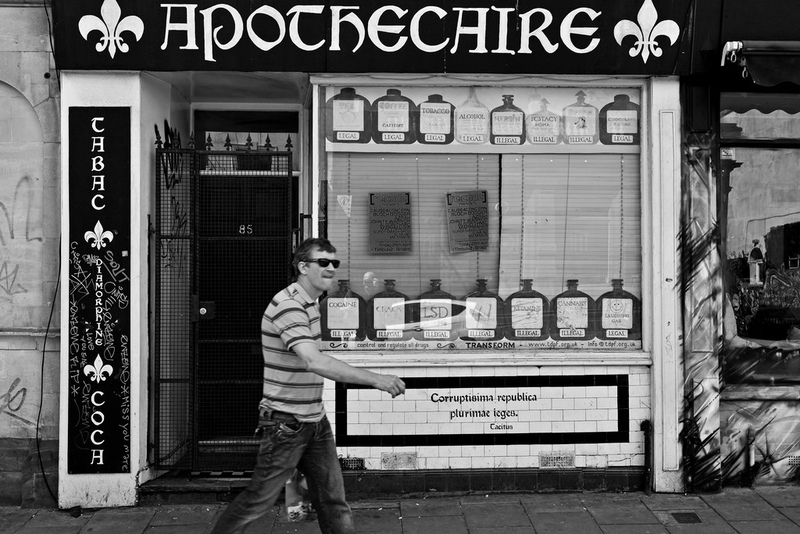 Starting from the concept of the ‘Apothecary‘, the place where you would get medicinal supplies, the collection of legal and illegal drugs addresses the arcane and bizarre drug laws that don’t make sense. 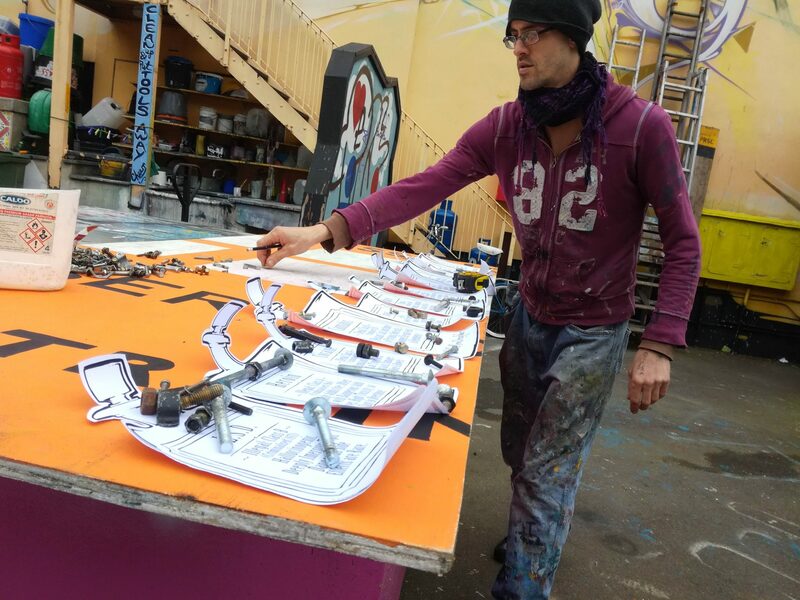 Together with Transform, a campaign group for drug reform, this installation wants to continue a meaningful discussion on how to approach drug-related problems. 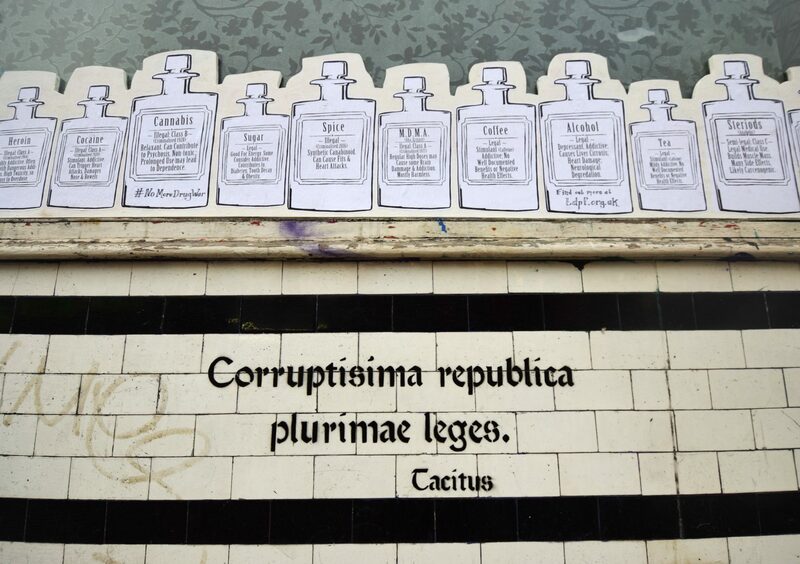 Below the window, the Apothecaire bears a quotation from the Roman Senator and historian Tacitus: ‘Corruptisima republica, plurimae leges’. This translates to ‘the more numerous the laws, the more corrupt the government. He wrote this critique in his Annals to address the power of the emperor to instate laws that didn’t improve anything for anyone. This installation was first created in 2009 (photo below). At the time of its reinstatement, early 2018, what has changed? BBC recently featured the documentary series ‘Drugsland‘, set in Stokes Croft and ‘Crack Alley’, going deep into the world of drugs as seen through of the eyes of professionals, users and dealers in Bristol. The recent criminalisation in 2016 of the synthetic drug ‘spice’ has also resulted in a sharp hike in drug related deaths, notably among the homeless. 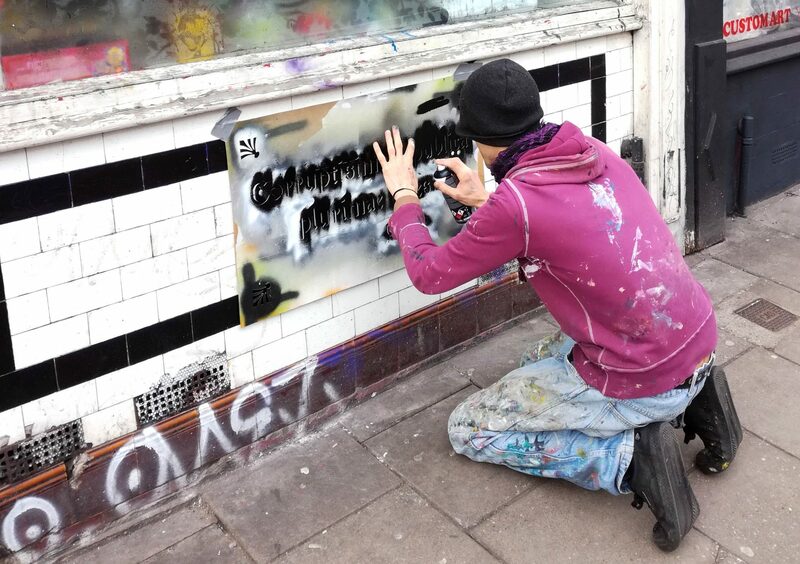 In Bristol 4 homeless people died in one week, among which was ‘Punk’ Paul Larner. 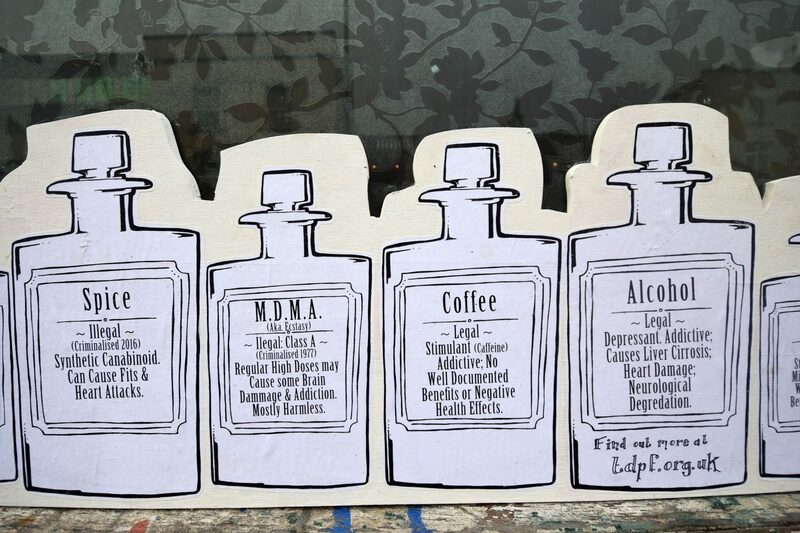 Criminalisation and prohibition of substances do not have a great record. Transform warned the government that banning ‘Spice’ and other so-called ‘legal highs’, would gift the market to criminals, make drugs stronger and more dangerous, and harm not protect people. These scenarios have been reported in Ireland and Poland after similar bans. 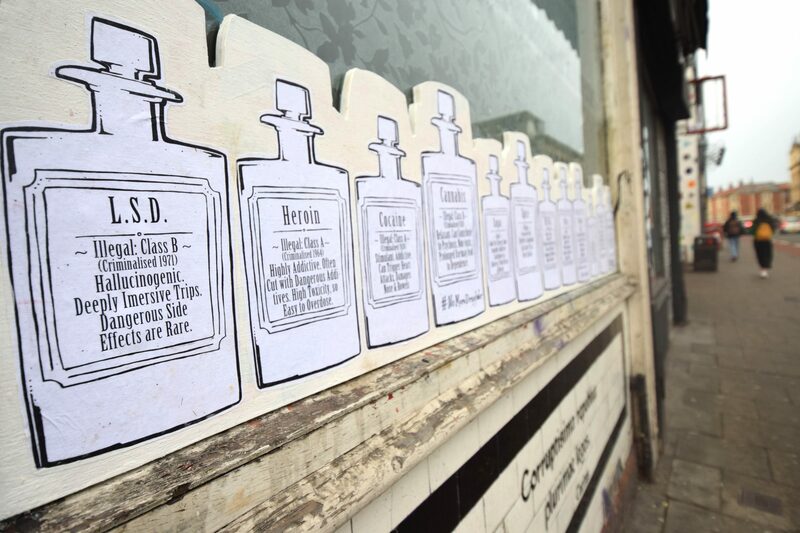 Over the years, helped by the Stokes Croft entropy, the flypostering gradually crept up. 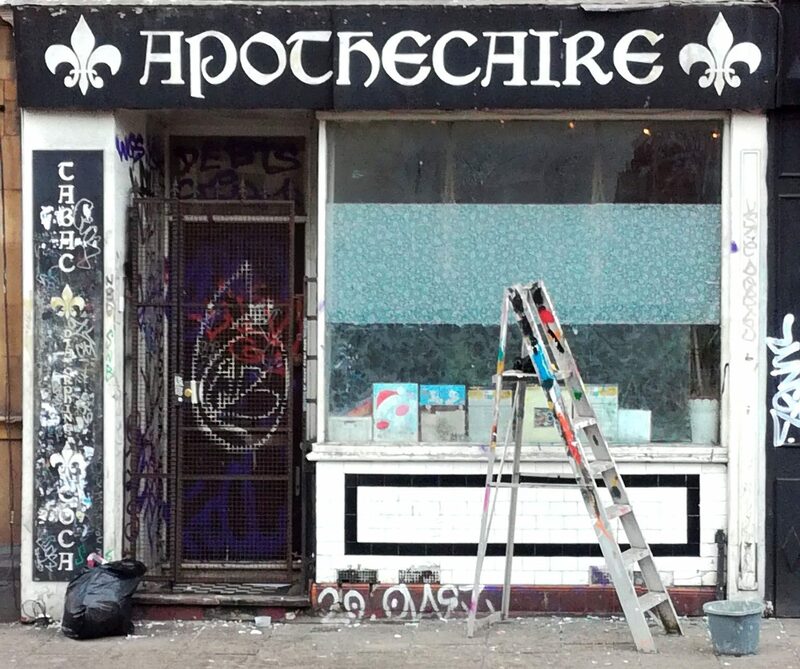 After a good scrub, the Apothecaire is now reinstated on the Croft.